San Diego Padres Hall of Fame outfielder Tony Gwynn, the head baseball coach at San Diego State University, died Monday after a battle with salivary gland cancer, which he blamed on his career-long habit of chewing tobacco. He was 54. Within an hour of the announcement, more than 300 comments were posted on the Padres website announcing his death. He died early Monday morning at Pomerado Hospital in Poway, surrounded by his family, the Padres said. Gwynn, who was 54, had been battling salivary gland cancer. 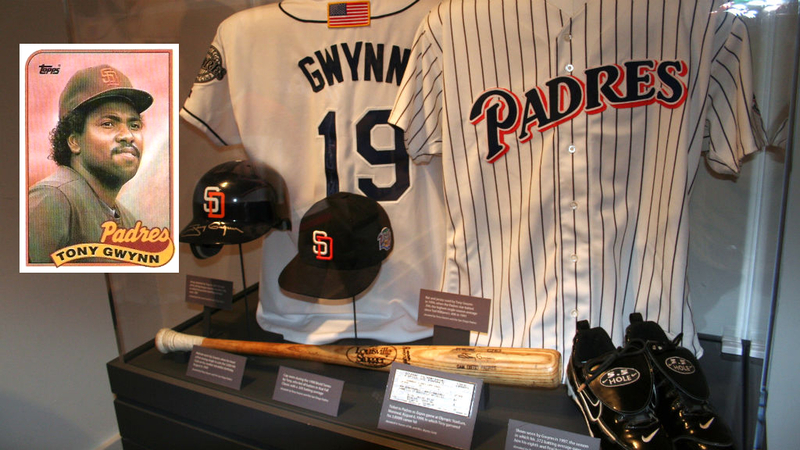 A right-fielder who came to be known as Mr. Padre, Gwynn belted 3,141 hits in his 20 seasons with Padres, had a .338 career batting average and was a 15-time All Star. His playing career ended in 2001, and he was subsequently picked as head baseball coach for SDSU, his alma mater. During his playing career, Gwynn won seven Silver Slugger Awards and five Gold Glove Awards. His eight batting titles tied for second-most in Major League Baseball history. “There are no words to express what Tony means to this organization and this community,” said Ron Fowler, the Padres’ executive chairman. 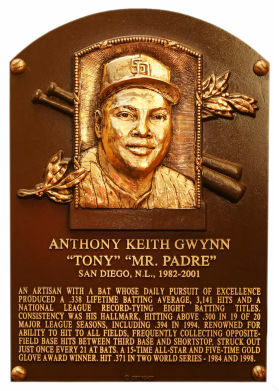 Another member of the Padres’ ownership group, Peter Seidler, said, “Tony was not only one of the greatest hitters the sport has ever seen, but also one of the greatest men to ever play the game. As a player who committed his entire career to one team and led the Padres to two National League pennants, Tony was admired and respected by all fans of the game. Tony Gwynn statue after the announcement of his death. Photo credit: San Diego Chargers/Twitter. Gwynn had a malignant tumor removed from his right cheek in 2009. He said he chewed smokeless tobacco throughout his career with the Padres and for many years after and blamed the substance for his condition. The cancer returned twice, and in 2012 he underwent radiation treatment in an effort to shrink the tumor, according to the Padres. He had surgery that year, in which the nerve that the tumor was wrapped around had to be replaced with one from his shoulder. Gwynn missed the second half of the recently completed season while he continued to deal with health problems. He had been on medical leave since March, but signed a one-year extension only Wednesday. 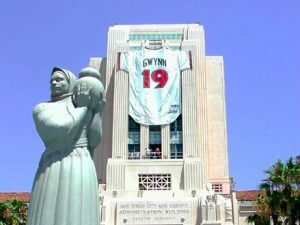 Shortly after Gwynn’s death was announced, city officials and other admirers issued statements via email or social media sites mourning the loss. Faulconer canceled two news conferences and asked for flags at city facilities to be flown at half-staff. 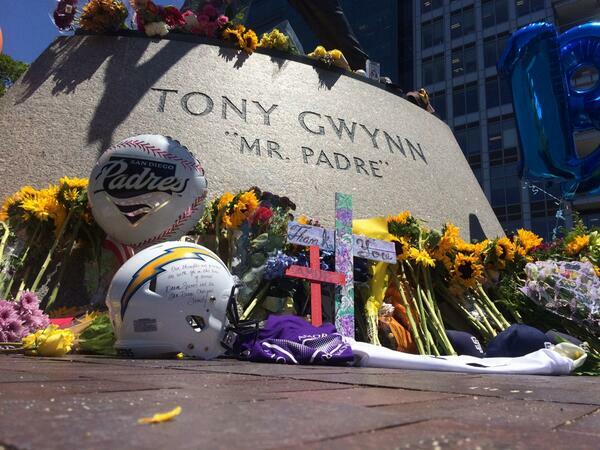 “My thoughts and prayers go out to Tony Gwynn’s family,” he said. Chargers President Dean Spanos said the city lost someone very special. Gwynn also played basketball, starring as a point guard for the Aztecs in college. He was drafted by the then-San Diego Clippers on the same day he was chosen by the Padres. 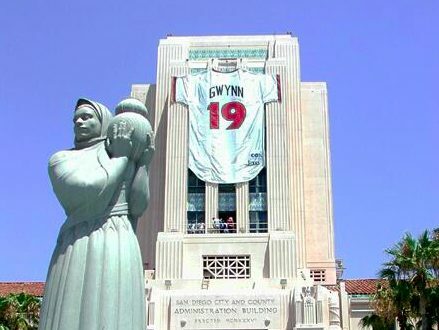 Shortly after Gwynn’s death was announced, other city officials and admirers issued statements on social media sites mourning the loss. City Councilman David Alvarez said the city was terribly sad to say goodbye to a teammate, a friend and a legend. “Rest in peace, Mr. Padre,” he said. City Councilman Mark Kersey said he was sending prayers to Gwynn’s family. Gwynn’s .338 career batting average over 20 seasons — all of them with the Padres — is the highest since Ted Williams retired from the Red Sox in 1960 with a .344 average. Gwynn’s playing career ended in 2001, and since then he had been the head baseball coach for San Diego State University, where he starred in both baseball and basketball as a collegian. He also was a part-time analyst on Padres telecasts. “Mr. Padre” won a record eight National League batting titles — equal to the number won by Honus Wagner — and collected 3,141 hits in his career. He was inducted into the Hall of Fame in 2007 along with Orioles great Cal Ripken. Gwynn underwent major procedures in his attempt to beat the cancer. In early 2012, a nerve that the tumor was wrapped around had to be replaced with one from his shoulder. He had been on medical leave from his head coach position at San Diego State since March and on Wednesday had signed a one-year extension. “The whole experience was traumatic because I thought I had it beat, and dang, it came back,” Gwynn said during a visit to the Hall of Fame later that year for the induction ceremony.